What horror film fan doesn’t like a scary flick filled with a fair share of gore, especially one featuring a bloodthirsty robot looking for love? VR now gives fans a chance to experience that scenario through ABE VR. The British Board of Film Classification (BBFC) says that you will need to be at least 15 to catch ABE VR in either of its formats, according to VR Focus. ABE VR is the first such title to receive an age restrictive rating from the BBFC. Application of the technology exploded recently as developers race to provide consumers new ways to use VR sets. ABE VR is one of the first films adapted specifically to be experienced using VR. Hammerhead VR developed the concept for ABE VR, based on the award winning Sci-Fi short ABE from Rob Mclellan. It tells the story of a misguided, malfunctioning robot looking for love from (or inside of) its human creators. If you think that sounds like a formula for disaster, you need to watch the trailer. It clearly shows that “disaster” does not even begin to describe ABE’s twisted search for acceptance. 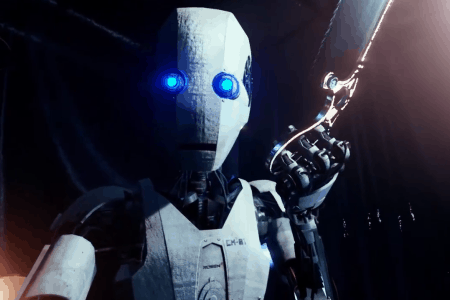 The film is justifiably categorized as a horror film, and tells the story of a robotic assistant that is glitching in the most disturbing way imaginable, with tie-down gurneys, bone saws, and all. The goal of ABE VR was to create a truly terrifying experience for users, and so far, it seems that Hammerhead VR has met its mark. The BBFC seems to agree with its 15+ rating. Abe VR is available now for Oculus and Steam VR.